Discover the hidden gems southern Africa has to offer, ranging from the Big Five of the Kruger National Park, the traditional Swazi Culture, to lazy days on the tropical beaches of Mozambique. Traverse the south eastern corner of South Africa across Zululand to Durban and discover the cultures and landscapes that exit here. Come and discover South Africa, Swaziland, and Mozambique with Adventour. You won’t know until you’ve done it! You will enjoy four nights of camping and four nights of accommodation in Kruger National Park (South Africa), Maguga Dam (Swaziland), Ponta de Ouro (Mozambique), and St Lucia (South Africa). You will be provided with comfortable dome tents with mattresses. You will depart from Johannesburg early morning from your place of accommodation and make your way through the Lowveld to the Kruger National Park. A quick stop on route for a late breakfast or lunch (own account) is enjoyed before continuing. The route showcases some of South Africa’s finest Lowveld farmlands before arriving at your lodge near the Kruger National Park. Time is spent relaxing at the pool or in your chalet before taking part in an open vehicle sunset game drive. 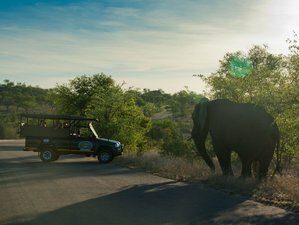 A full day game drive is on the menu for the day in an open 4x4 game drive vehicle with a local guide. You will have an opportunity for excellent game viewing to sight the Big Five, as well as hundreds of antelope and bird species, exist today. Big Five animals, such as the elusive leopard, sight is not guaranteed during the day. You will make your way through the Skukuza area of the Kruger Park throughout the day in the effort to tick off most of the wildlife that the Kruger has to offer. Lunch is on your own account at one of the rest camps. Traveling south of Hazyview, you will make your way through the small town of Nelspruit and Malelane towards the border of Swaziland at Jeppes Reef (check visa requirements). It is a short distance to Maguga Dam where you check into your campsite overlooking the Dam. Afternoon will be at leisure on the Maguga Dam. Swaziland is a small landlocked monarchy in Southern Africa and is known for its cultural festivals showcasing its traditional Swazi culture. You will spend the day exploring this area visiting the famous Ngwenya Glass Factory, the traditional villages, and the market near the capital city of Mbabane. Enjoy a lunch on own account at the local market. Departing Maguga Dam, you will make your way through Swaziland through Mbabane and Manzini to the next border crossing into Mozambique (check visa requirements) at Goba. Mozambique is famous for its long Indian Ocean coastline where you will find some of most spectacular beach vistas and activities. Arriving mid-afternoon at the lodge at Ponto do Oure, you will check in and spend the rest of the day at leisure and planning ocean and beach activities for the next day. Enjoy a relaxed morning on the beach at Ponto do Oure before departing back into South Africa. Heading south for just 10 kilometers, you will cross the border at Kosi Bay (check re-entry visa requirements). There will be stopping for a short stop at Kosi bay before heading inland passed Mkhuzi Game Reserve and lake Jozini arriving at the accommodation for the next two nights. Afternoon will be at leisure. After a short 250-kilometer drive heading south along the coast, you will bid farewell. Should you choose to return to Johannesburg with Adventour the following day, there will be an optional extra charge of 800 ZAR. This is the end of Adventour services. This safari will take place in South Africa, Swaziland, and Mozambique. South Africa comes from a long history of colonial venture and racial history dating back into the early 1800’s and before the early Portuguese settlers, but it can also be said that South Africa over the years has united into one “rainbow nation” that boasts itself as being the economical hub of Africa and the most sought-after travel destination in Africa. South Africa has it all. Deserts, pristine beaches, rugged mountains, wetlands, woodlands, nature reserves, and adventure sports. From the smallest back town to large cities and not to forget - Table Mountain in the fairest cape. This nine-day bush to beach safari includes seven dinners and eight breakfasts. All lunches are on guests own account. For Adventour and its travel partners to properly cater while on tour, it is important to inform they at the point of booking should there be any special dietary requirement. Please book your flight to arrive at Tambo International Airport (KNB). You can arrive in Johannesburg the day before departure or early on the day of departure to the Kruger National Park. Adventour will collect you from your place of accommodation or Tambo International Airport (KNB) on the morning of departure. Adventour brings you closer to your safari in South Africa, Namibia, and Botswana. It’s all about the safari!